The Papa Johns Bowl game (also known as Birmingham Bowl), or how most of us call it, the PapaJohns.com Bowl (named after its title sponsor PapaJohns Pizza) - a rather new Bowl game - is an annual college football bowl game in the post-season and usually takes place in early January at Legion Field in Birmingham, Alabama, marking 2010 the 1st time the game is not held in December. The first Bowl was just played a few years ago in 2006 when South Florida took on East Carolina. It then was the first bowl game played in Birmingham since the departure of the Hall of Fame Bowl (which is now the Outback Bowl) to Tampa, Florida in 1985, and the canceling of the All-American Bowl in 1990. In 2010 the following teams will be matched-up: The South Carolina Gamecocks, representing the University of South Carolina (USC) from Columbia, SC in the SEC (Southeastern Conference Eastern Division) vs. the Connecticut Huskies, representing the University of Connecticut, Storrs, (Town of Mansfield), CT in the Big East Conference. The title sponsor since 2006 is Papa John's Pizza (NASDAQ: PZZA), the 3rd largest take-out and delivery pizza restaurant chain in the United States with its headquarters in Louisville, Kentucky. Although the Bowl is quite new, Birmingham as host city has a history of bowl games played there. It started with the Dixie Bowl in 1947 and 1948, the Hall of Fame Classic from 1977-1985 (which was then relocated to Tampa, FL and received a name change to Outback Bowl), and lastly, the All-American Bowl from 1986-1990. 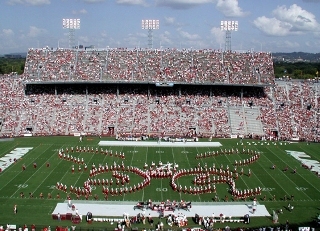 The game location is Legion Field, which is located in Birmingham, Alabama. Other names you may have heard in conjunction with the stadium are "Football Capital of the South", "Iron Bowl", "Old Gray Lady". It was opened way back in 1927 and can hold over 71,000 spectators. It is the home of the UAB Blazers, who compete in Conference USA. Buy your PapaJohns.com Bowl Tickets now before it is too late and be one of the tens of thousands enthusiastic fans in this great stadium.